Atop "Ol' Barney" ~ The History Girl! Barnegat Lighthouse, often referred to as "Ol' Barney"on Long Beach Island is one of the Jersey Shore's most recognizable landmarks. From travel guides to tourism ads, you often see the lighthouse standing tall, mere yards from the water. However, like many lighthouse locations (with some exceptions), the shore has eroded over time, leaving the structure perilously close to the water. The first lighthouse at Barnegat was constructed in 1835 on land once owned by Bornt Slight and his wife Ruth, of Tuckerton, New Jersey. Approximately 40 feet high, it served as a guide to the inlet, as opposed to a seacoast light. Its first keeper, appointed August 3, 1835, was Henry V. Low. The original lighthouse was built approximately 900 feet from the water but because of strong currents and shifting sands, it was only 450 feet away from the water by 1845. In an 1852 lighthouse report, the lighthouse was criticized for only serving the inlet and its beacon's limited sight distance, about 10 miles on a clear night, according to one skipper quoted in the report. The lighthouse was equipped with a fourth-order Fresnel lens and ships often confused it with the light of another ship. When Lt. George G. Meade examined the lighthouse in 1855, he found it poorly constructed and that the sand at the base of the lighthouse was eroding. Meade recommended a new seacoast light be constructed at Barnegat due to the number of shipwrecks in the area. On August 18, 1856, Congress authorized $45,000 for rebuilding the Barnegat Lighthouse. Meade supervised construction of the lighthouse from plans drawn by Lt. W S. Reynolds. Construction of the present 165 foot lighthouse began in 1857 and was completed in 1858. It is the second tallest lighthouse in New Jersey, after the Absecon Lighthouse. Like the Absecon Lighthouse and the 1859 Cape May Lighthouse, it is constructed of two heavily reinforced circular brick walls, one inside the other, on top of a sunken foundation. A circular cast iron staircase with 217 steps to the watchroom, just below the lantern room, was installed. The bottom half of the red brick tower was painted white and the top half, including the lantern room, was painted red, giving this lighthouse its characteristic daymark. At the base of Barnegat Lighthouse. Unlike its predecessor, a first-order flashing Fresnel lens was installed. The lens, built near Paris, France, cost $15,000 and measured eight feet in diameter and fifteen feet high. It flashed white once every ten seconds. The lighthouse was first lit on January 1, 1859. James Fuller of Vermont, the last keeper of the old light, was transferred to the new light. Originally the lens burned lard oil. In 1888, it was converted to kerosene, and in 1910 it was changed from oil to incandescent oil vapor. Erosion continued to plague the lighthouse. Nine jetties were built in an effort to slow the erosion in 1869 and 1870. In 1893, the existing keepers' dwelling at the base of the lighthouse was modified and enlarged into a triplex structure for the lightkeeper, two assistant lightkeepers, and their families. Due to continued erosion, this structure was lost to the waters of the inlet in 1920. In the early 1930s, local residents rallied to save the lighthouse once again from encroaching waters by building a makeshift jetty out of junk cars, metal, and even baby carriages! In 1934, the Federal Government funded a $12,000 project to encircle the tower’s foundation with steel rings covered by cement and pilings further out creating a semi-circle around the structure. 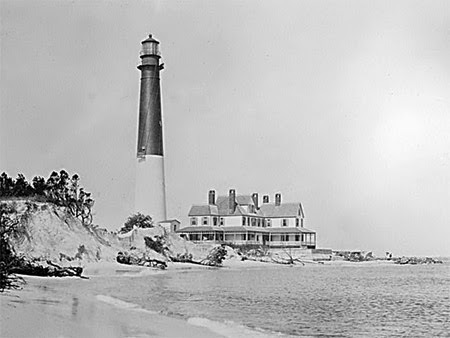 The Barnegat Lighthouse and Keepers' Triplex, circa late 1910s. Note the eroding shoreline. Source: Library of Congress. In 1927, LV 79, known as the Lightship Barnegat was established eight miles east of Barnegat Inlet and the lighthouse was automated. The first-order Fresnel lens was removed from the tower. The lightship remained there until the start of World War II in 1942 when it served as an examination vessel at Edgemoor, Delaware for all ships entering the Delaware River. The ship returned to service off the coast of Barnegat in 1945 and served until it was decommissioned March 3, 1967. It was replaced by a lighted buoy in 1969. Today, the Barnegat is docked at Pyne Poynt Marina in Camden, New Jersey awaiting maintenance and repair work. The ship was originally built in 1904 by the New York Shipbuilding Company in Camden, New Jersey for $89,030. During World War II, from 1940 to 1944, the lighthouse was used as a lookout tower for enemy ships. On January 1, 1944, the lighthouse was discontinued and turned over to the State of New Jersey. The property and other outbuildings had been previously transferred to the state on May 8, 1926. The original first-order Fresnel lens was returned in 1954 to the Borough of Barnegat Light, formerly Barnegat City borough, after being moved to Staten Island and then the Rosenwald Museum in Chicago. It is now proudly on display at the nearby Barnegat Light Museum. View from the top of Barnegat Lighthouse, looking toward Barnegat Light State Park and the Atlantic Ocean. In 1957, New Jersey dedicated the land surrounding the lighthouse as a state park. The lighthouse was added to the National Register of Historic Places in 1971. In 1988, the lighthouse was closed for repairs and the installation of a new south jetty. It reopened to the public in 1991. In 2001 and 2009, studies were conducted on the lighthouse's tilt by the U.S. Army Corps of Engineers related to beach replenishment projects. WJE Engineers determined that the lighthouse has a pre-existing tilt of one degree toward the northwest, which equates to an out-of-plumbness of approximately twenty-one inches at the top of the lighthouse. The year-long study determined that the tilt in this masonry structure changes daily from fluctuations in environmental variables, such as temperature, but is negligible. On the lighthouse's 150th birthday, January 1, 2009, it was relit after the Friends of Barnegat Lighthouse State Park purchased and installed a new 22-mile VRB-25 light system. The Friends also replaced all of the lantern room's window panes, ensuring that the lighthouse will shine bright for another 150 years!